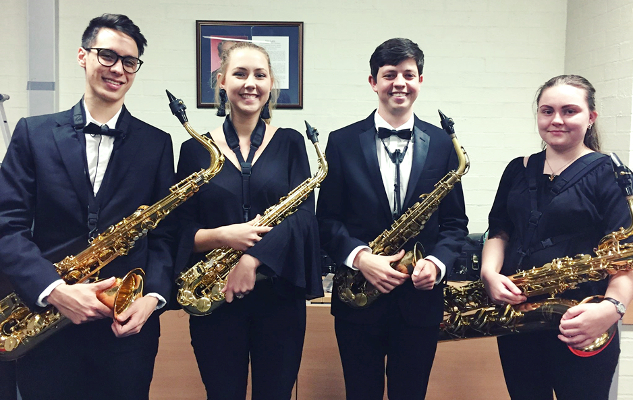 Having recently performed and competed in venues across Brisbane including the Basil Jones Orchestral Hall, Lady Cilento Children’s Hospital, the Gehrmann Theatre in Spring Hill and St Peters Lutheran College, the Epsilon Saxophone Quartet is quickly building its reputation and experience as a contemporary chamber ensemble. To date, their performance at the Melbourne International Saxophone Festival will be their most ambitious and exciting. Originally forming as part of an ensemble course at the Queensland Conservatorium, the group discovered a mutual enthusiasm for performing the works of Piazzolla, Nyman and Mellits. Moving forward the quartet hopes to bring an exciting mix of old and new-age contemporary music to its expanding audiences.